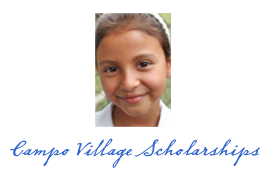 Seventy percent of Honduran children are unable to attend school. In the village of El Campo, where the average income is $7 a week, fifteen boys and girls will complete their education today as they proudly graduate from sixth grade. These families live in unimaginable poverty with little opportunity for a better tomorrow. Together, we can change the future of fifteen children. We ask you to help raise $5655. During this wonderful season of giving, please bring hope and education for these children by making a contribution to Hope for Honduran Children.